The 28.04 metre gentleman’s motor yacht Olympus, listed for sale by Brian Holland at Fraser Yachts, has been sold. Built with yellow pine on oak frames by the New York Engine Company to a design by John H Wells and Olin J Stephens, she was delivered in 1929 and has been refitted several times since. Her mahogany lined interior has accommodation for eight guests in four cabins consisting of a master suite, VIP suite, a double and a twin, all with entertainment centres and en-suite bathroom facilities. Crew accommodation for four staff and maintenance facilities are located forward while all guest cabins are aft, enabling crew tasks to be carried out without disturbing the guests. On the main deck forward is a large formal dining room with seating for eight guests, while aft of the saloon is a wet bar area and the fantail lounge space with a partially enclosed dinette/settee and wrap-around stern seating. The entire fantail area is enclosed in clear acrylic isinglass, with easy opening sliding panels to port and starboard. 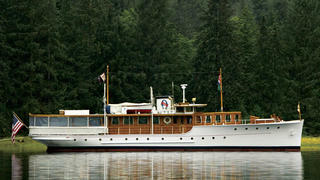 Olympus is a well-known classic yacht with a strong historical provenance. She has entertained several presidents, heads of state, Hollywood celebrities and other dignitaries. Twin GM 6-71 diesel engines give her a sedate cruising speed of nine knots. Lying in Seattle, Washington, Olympus was asking $950,000.